Working at Field Station: Dinosaurs is an extraordinary opportunity. It’s the start of something BIG. It is fun because we don’t take ourselves too seriously but take what we do very seriously. We believe in giving our guests more than they expect. We do this by hiring passionate people who are committed to making a difference. Whether greeting guests, leading workshops and games, operating puppets, parking cars, grilling lunch, or selling tickets, everyone plays their part. Every position is important; every employee has the power to impact our success. We are committed to developing, supporting and encouraging our staff at every level, so that we may actively promote from within, creating bright, rewarding careers. We believe in rewarding great ideas, enthusiasm, leadership and hard work. If you have high energy, a fantastic attitude, love people and hard work, then the Field Station may be the place for you. Email your resume to ksjobs@fieldstationdinosaurs.com with the position you are applying for in the subject line. Include a cover letter telling us why you have what it takes to be successful at the Field Station and how you will make us stronger. Heading up the team at Field Station: Dinosaurs is Guy Gsell. 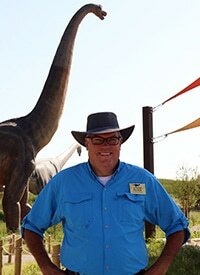 An adventurer, teacher and life- long dinosaur lover, Guy has produced educationally themed theater, live events, and exhibits in a career that spans thirty years and three continents. As the Founding Director of Discovery Times Square in Manhattan, Guy created sold-out workshops and ancillary programming for the famous “King Tut” exhibit as well as “Titanic: The Artifact Exhibition” and “daVinci’s Workshop”. He was a Producer at the 2011 World Science Festival and, for six years, Managing Director of the Two River Theater Company in Red Bank, New Jersey where he launched one of the State’s top theater education programs. He spent twelve seasons touring the world’s theaters and classrooms with the renowned Paper Bag Players, America’s foremost theater company for children. He has taught at the high school and college level, acted off-Broadway, written two plays, appeared on Jeopardy!, and appeared at some of New Jersey’s legendary music venues as a singer-songwriter. At the Field Station, Guy is finally able to combine his serious dinosaur obsession with his love for family entertainment, hands-on teaching and working with children. 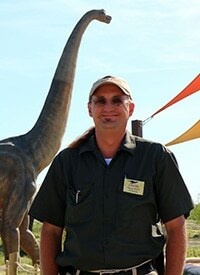 Lon brings over thirty years of experience in the hospitality and attraction business to Field Station: Dinosaurs, having served as executive director of the Kansas Aviation Museum for eight years locally, adding to that a background in hotel, restaurant and event management. Lon holds a bachelor of science in speech communication, a master of arts in speech communication and a master of public administration and nonprofit management. Lon lives in Wichita, KS with wife Sherri and enjoys singing in any of roughly ten languages. His favorite dinosaur is the T. rex. Like most kids, Steven has been fascinated by dinosaurs since a young age. Growing up in northern New Mexico, he got to participate in several actual paleontological expeditions to the De-Na-Zin wilderness. After his degree in biology/chemistry and a masters degree in education, he is thrilled to be back working with, talking about and sharing his love of the prehistoric beasts! Steven’s favorite dinosaur is the Pentaceratops. 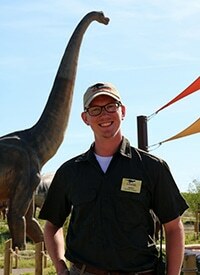 Garion brings a wide variety of skills to Field Station: Dinosaurs. Originally from the Wichita area, he went to Emporia State University where he studied theater, music and public relations. While there, Garion moved off-stage and spent time as a co-technical director of the improv comedy troupe, Zoiks!, was an active member on campus in a number of different organizations and worked in the historic, 1200-seat Albert Taylor Hall as a stage manager and technician. After finishing at Emporia State, he returned home to Wichita and worked with local advertising firm, RSM Marketing. Garion’s favorite dinosaur is the Velociraptor.